The OB23 Orbital CNC tube bender with an integrated end former pulls the aluminum from a bulk spool, straightens it, bends it, end forms it and drops off a complete part. This machine allows you to increase your profitability through reduced cycle time and labor costs. The Windows interface operating system allows a user to edit programs, view 3D models, run the machine as well as store programs for future use. The OB23 utilizes on board diagnostics, and user friendly help screens help navigate bender functions ensuring that your machine stays operational. This machine was designed with safety in mind. The Safety Laser Scanner, E-stops, and Guard door interlocks all come standard on the machine to safeguard the operator. The Laser Scanner monitors the perimeter for unintended objects for the operator’s protection. The OB23 can be programmed by either directly entering in the LRA values to the PC interface or the user has the option to read in a STEP file direct from CAD. Either way, the machine is simple to program. This picture includes the bulk spool insert option, required for bulk spools without a cardboard reel. An Orbital CNC Tube Bender with an End Former. 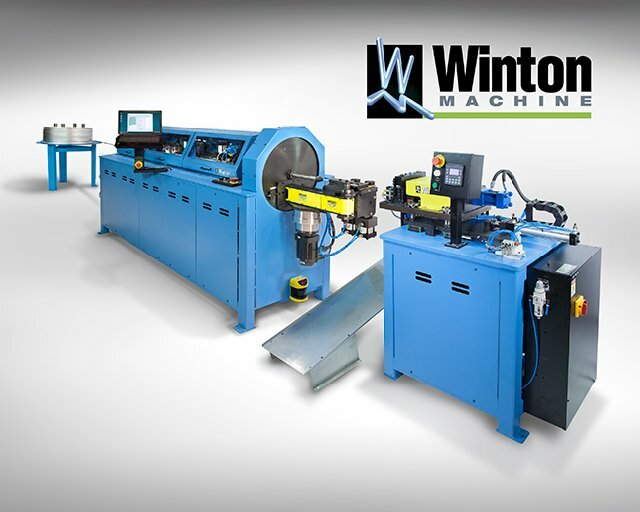 Cuts tubing, Bends tubing, and End forms tubing in One Machine from Winton Machine on Vimeo.